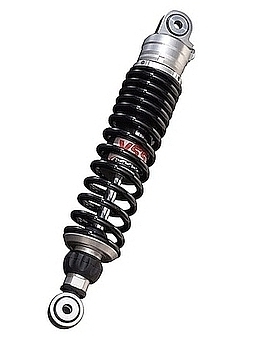 On this page you'll find summaries of the brands of shocks we sell to suit many sports bikes and general road bikes. They're shown in order of increasing price & performance, although because each brand has a range of performance options they all overlap! 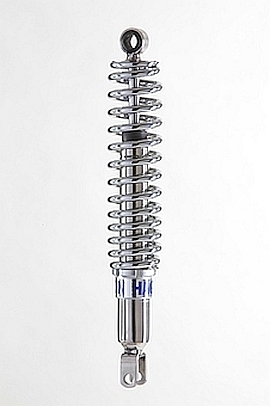 Betor road shocks are universal shocks - they are only available with one, general purpose spring rate. But the springs are very progressive, and the dampers are pressurised with nitrogen, so they are a cut above economy shocks and a good value choice for a wide range of British, European and Japanese bikes. They are the cheapest decent quality shocks, with 5-position preload adjustment (needs a C-spanner, £3 extra) and we supply them with the correct bushes for your bike. Available in three styles as shown: prices from £115/pair delivered with a 1-year warranty. 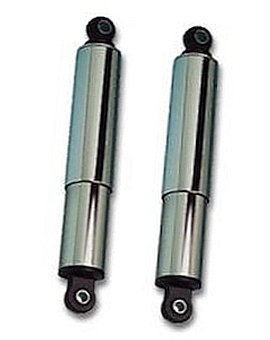 These 320mm shocks with fork mounts fit many small Honda twins & fours. Also 330 & 360mm. 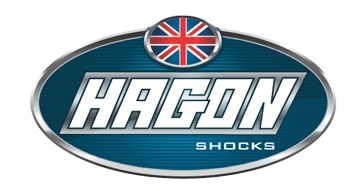 Hagon road shocks are made in the UK to suit most twinshock bikes - probably the widest range in the world, with damper lengths from 255mm - 370mm, and spring ratings 56-250 lbs-in. Standard shocks have a black 28mm damper with either black or chrome springs (£7/pr extra for chrome) and a 3-position preload adjust cam. Springs are around 60mm o.d., though slimline to suit older bikes are a no-cost option. 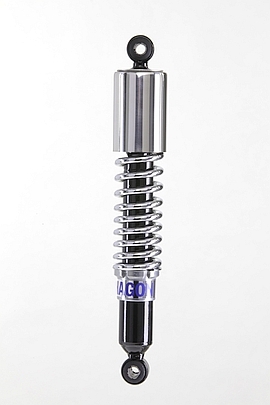 Dampers are also available in polished stainless steel with any spring option. And they can be ordered with stainless steel top caps. 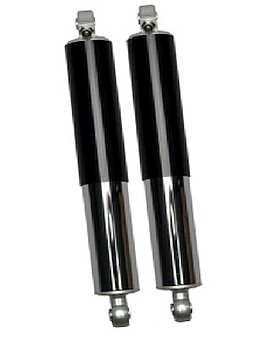 These are gas shocks with separator pistons and represent an upgrade for many bikes. Although not rebuildable (the dampers are crimp-sealed around the shaft), they come with a 2-year unlimited mileage warranty. Fork or ring type mountings. 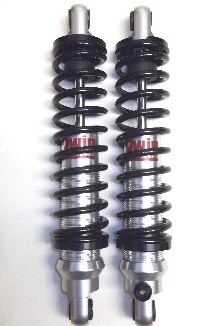 Choice of standard or slimline springs (std shown). 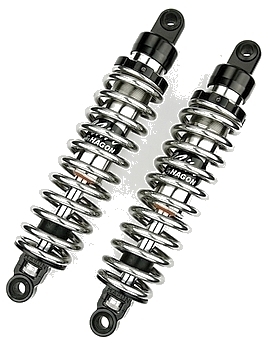 Hagon Classic 1 shocks with slimline springs & short top cap. 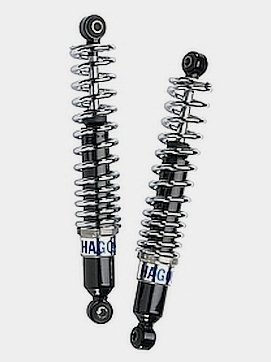 Hagon’s 2810 range are gas shocks similar to the popular standard range, but incorporating 10-click adjustable damping (automatic compression/rebound balance). Available for a wide range of bikes, lengths 270mm-370mm. They’re designed to be mounted rod down (ie adjusters at the base). 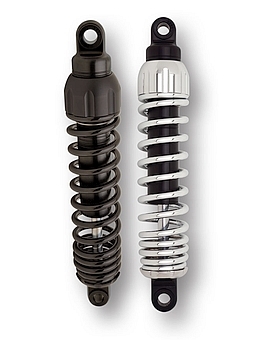 Spring options are the same as the standard road shocks. These 2810s are the best value shocks with adjustable damping on the market. Also available with shiny stainless steel dampers. Hagon 2810's £196/pr with chrome springs. Or with stainless dampers at £246/pr. 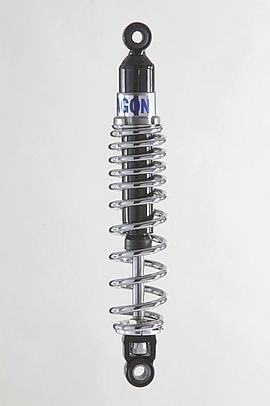 Hagon’s top of the range shocks are their fully rebuildable NITROs. These chunky 38mm all-stainless steel shocks have 10-click adjustable damping, impressive 18mm hard chrome rods, and wide 73mm o.d. springs. They’re built to order to ensure they match individual rider weight and/or height requirements. The end caps, adjuster housing and spring seats are aluminium, anodised in silver or black. 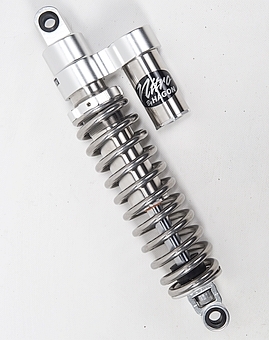 And Nitros are now available as Piggyback shocks, with either black or stainless steel reservoirs and choice of springs to match. Apart from the chunky style, the separate piggyback reservoirs offer improved performance: with an increased volume of oil and greater shock body area, these units will stay cooler and so maintain performance when pushed hard. and fully variable preload adjustment. Built to order to suit your weight. low pressure gas to reduce foaming. Quality at a good price: £165/pr. As shown or all black £310/pr. Shown here are the RE302, RZ362 and RG362 ranges, which all have threaded preload adjustment, all mount rod-down to reduce unsprung weight, and all are rebuildable. The RE range have 30mm pistons while the RZ & RG ranges have chunkier 36mm pistons. All have 12mm hard chromed shafts, though heavier duty models with 16mm shafts (RZ366 & RG366) are specified for some bikes. 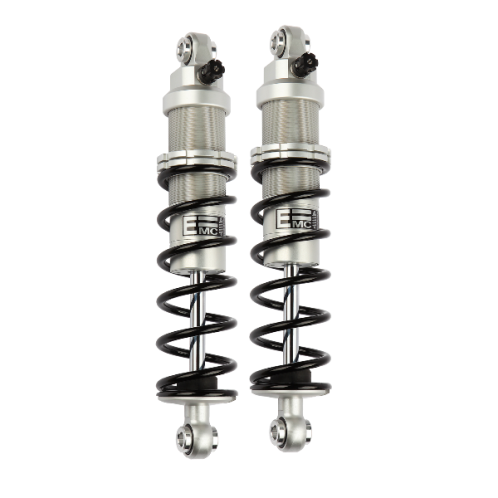 Also available is the RC302 model, which are piggyback shocks like the RG362, but slimmer and without the damping adjustments. Well suited to bikes like CB400SF, XJR400R, CB1000 they are priced at just £225/pair delivered. We also stock the YSS Pro-X and Bravo RD222 ranges: these are listed in our economy section. Koni stopped making bike shocks years ago, but all the designs etc were transferred to IKON, who have carried on making exactly the same shocks, still the chrome damper/black spring 7610 series and all the same applications plus of course lots of new ones. The 7610's still have 3-position preload adjustment and 4-position dial a ride damping adjustment. If you are one of the thousands of riders who liked the old Konis, you'll be happy with a pair of Ikons. Also available in SP8 form (chrome springs and chrome top cap), while SP15's add chrome bottom caps. SP14's are all black, SP16's are all black with top caps. And SP17's are standard shocks but + chrome top caps. Alloy bodies with infinite preload adj. IKON have also updated their products with the introduction of two new ranges. These are the 76-series BASIX range, which are designed primarily to provide a cheaper option for classic bikes. They have the same chrome dampers as 7610's but without the damping adjustment, and they have slimmer less progressive black springs to give the classic look. 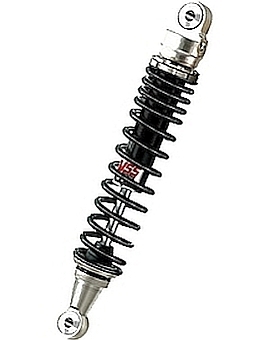 The second new range is the 7614 shock. 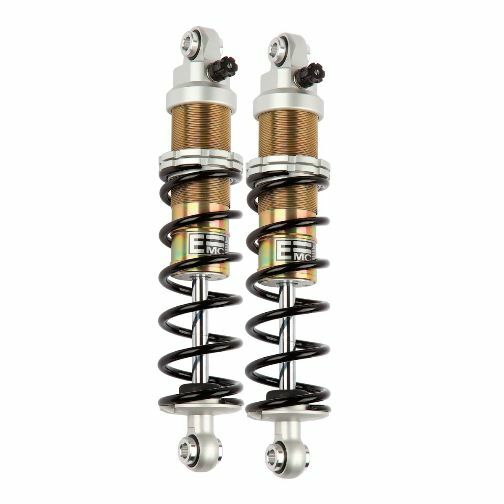 These higher performance shocks have gas-pressurised dampers, lightened via alloy bodies, with threaded preload adjustment as well as the traditional 4-position dial-a-ride damping adjustment. Each range of shocks come in various lengths, mainly 11/11.5/12/12.5/13/13.5-inch (280/292/305/318/330/343mm), and with standard or heavy duty options depending on the weight the bike will carry. Standard shocks will suit riders who weigh up to around 15st (95kg) and carry an occasional pillion. Heavier riders or those who mainly ride 2-up will gain a more controlled ride, with less chance of bottoming out, with heavy duty shocks. Progressive 12-series. Black 41mm o.d. gas dampers. Choice of lengths and spring rates. Black or chrome springs. £289.00/pr. have chrome springs and end caps. full chrome covers at £353/pr. have black springs and top cap only. But we can build specials! 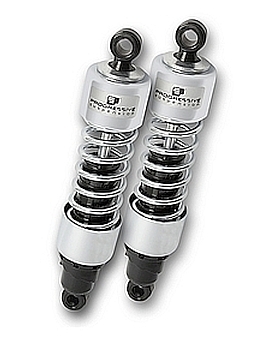 The ever-popular 412-series shocks are very good despite being the cheapest Progressive range. They have twin-tube nitrogen pressurised dampers with multi-stage velocity sensitive valving to give smooth and consistent 2-way damping. Bodies are 41mm o.d., chunkier than many so more able to dissipate heat. They have offset bottom eyes to allow more clearance. Must be mounted rod-up. Preload adjustment is 5-position cam style. 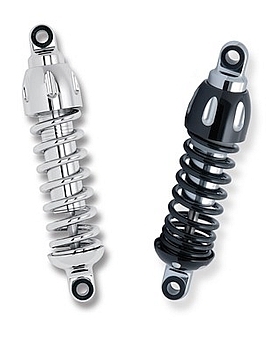 Springs are progressive, around 65mm diameter, with a range of rates: 75/120 lb-in, 90/130, 105/150, 120/170 & 140/200 are common, while some of the heavier Harleys have stronger springs. Although not rebuildable 412's are long-lived shocks. 12-series shocks are the same as 412's but without end caps. 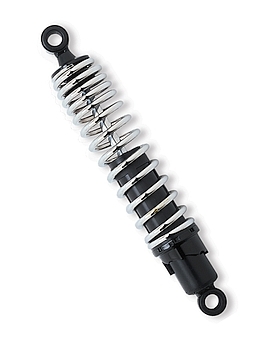 Dampers & springs are available separately if required. 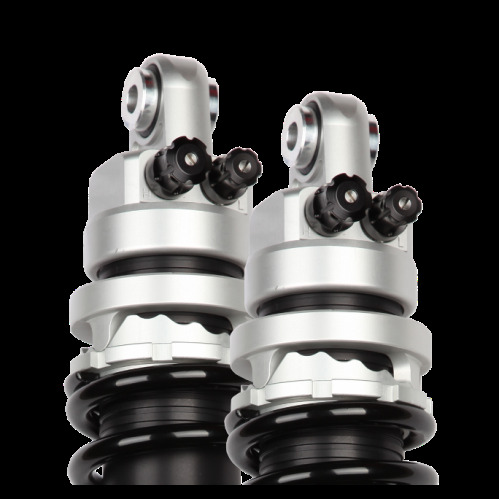 The 430-series shock range use high pressure gas monotubes with larger pistons and deflective discs for tighter damping control. Preload adjustment is tool-less, by twisting the top cap on the damper's threaded body. Styling is strikingly different and modern, with polished chrome damper body and aluminium fluted end caps. Beautiful to look at and to hold, and you won't be disappointed with the performance. They are happy to work either way up. 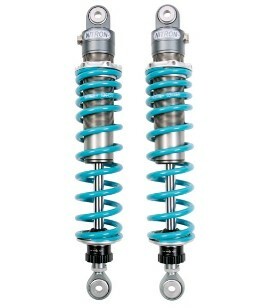 The 444-series shocks are selling very well due to their combination of understated styling and brilliant performance. They are an improved replacement for the successful 440 range, and incorporate Progressive's Frequency Sensing Technology. This innovation allows the damper to sense the difference between low speed frame movement and high speed wheel displacement, which results in optimised shock control whatever the road conditions. Machined ally dampers & tool-less preload adjustment. Top of the Progressive twinshock range are the 970 piggybacks. Inspired by racers, riders and those that demand more of their bikes than weekend coffee runs, the US-built 970 Series shocks combine a high pressure gas monotube design with deflective disc damping routed through two unique circuits - discs on both sides of the fully floating piston. Aluminium bodies with anti-friction coated internal surfaces. Unusually for a piggyback shock, only the compression damping is adjustable (18 clicks), while rebound damping is fixed for each application. Not a big seller - the high price as a result of the rising dollar/£ rate means that these shocks are expensive. But press reviewers have loved their performance, they're beautifully made, so ideal if you want great shocks that are a little different. Bronze or black finish. £1100.00/pr. 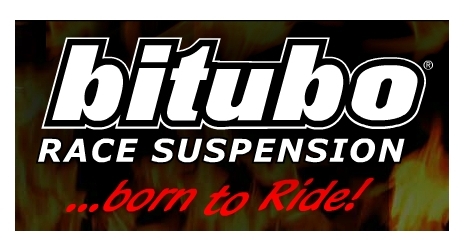 Italian firm Bitubo began making industrial shocks back in 1963, and moved into motorcycle race suspension from 1975, winning world titles within a few years. 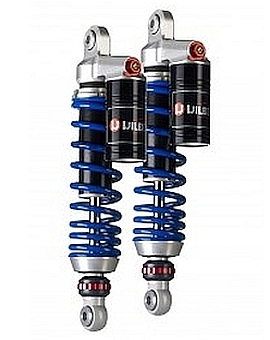 Since then they have continually developed their race winning products, gained TUV approvals, and also launched ranges of shocks with over 1400 applications. Bitubo twinshocks for road bikes are well made, stylish and reasonably priced. 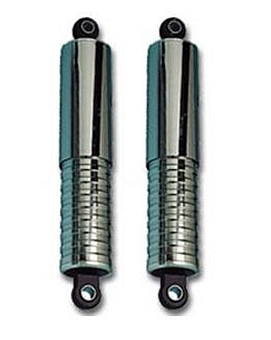 They are gas shocks (pressurised nitrogen with floating piston),have polished steel 36mm dampers with 12mm rods, polished alloy ends, and stepless preload adjustment. They're designed for rod-down installation to reduce unsprung weight. Springs can be straight or progressive - Bitubo suit the spring choice to the bike. Not a name that many people have heard of yet, but surprisingly good value, 2win twinshocks are built in the UK. 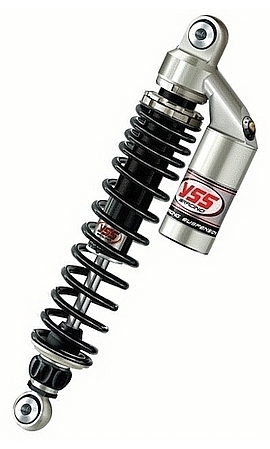 2win shocks have both adjustable damping and continuously variable preload adjustment. The single damping adjuster covers a wide range of options, controlling both compression and rebound with 14 clicks of adjustment. With each extra click both compression and rebound are increased keeping the same preset ratio to give great control over the hardness or softness of your ride. All the shocks are built to order, with springs and damping rates chosen to suit rider/passenger/luggage weight and riding style. Construction is mainly CNC-machined aluminium so very lightweight, and with clear anodising for good looks that last. The springs are hardened and tempered then shot blasted and finished in a tough, long lasting epoxy polyester powder coat. We can also arrange for the dampers to be black anodised for the all-black look, although this can add up to 3 weeks to the delivery time, and costs £25 extra. They come with a 2-year warranty and are rebuildable. At the moment the range of applications is over 200 and growing, with many popular sports bikes covered. 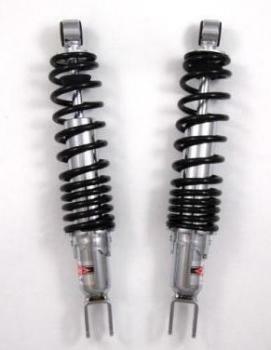 We can also get upgraded shocks for sidecar outfits, and special build shocks, normally all at the standard price. to suit rider weight etc. 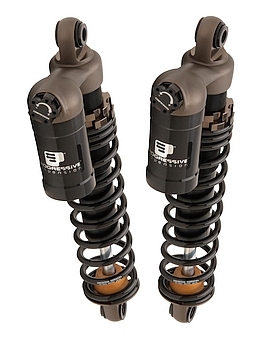 Fournales air shocks have been around for more than 30 years. They started out with competition-winning trials shocks and developed hundreds of applications over a few years. Made to order in France, they have a dedicated following among riders who appreciate their excellent performance, long life, ease of adjustment, light weight, and most of all the quality of ride they provide. These days Fournales also make suspension units for light aircraft, and the bike shocks benefit from this high-tech knowhow. They are high-pressure air shocks, with the air acting as a very progressive spring, with hydraulic damping tuned specially for each bike model. 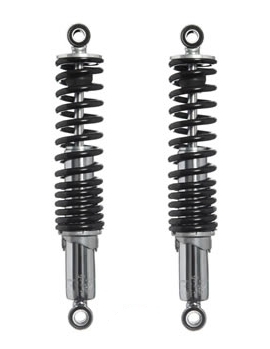 The internal air pressure can be adjusted (in effect to provide your perfect spring rate) and once set up these shocks will not bottom out - they simply get harder as they are compressed. As a result both traction and performance under braking are improved, and the superb ride quality is ideal if you or your passenger suffer from back pain. 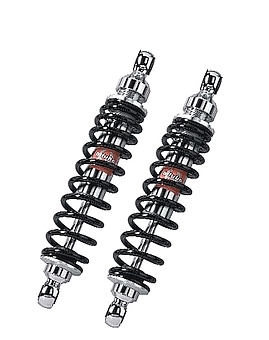 The twinshock range comprises four designs of rear shock (excluding Harley softails), with a wide list of applications - although Fournales seem most popular with Guzzi, Triumph and Harley owners. 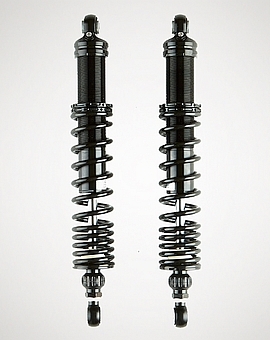 The Air Twins and Classics are both slimline shocks, with 50mm lower body diameters. Air Twins are finished in black steel top covers over chrome sliders, and have an exposed schrader air valve at the top. The Classics have the same internals, but have a chrome top cover which conceals and protects the schrader valve. (To adjust the pressure, the top cover unscrews and drops down to expose the valve). Magnums have a chunkier look to them, and are popular on larger bikes and cruisers. They are all chrome with a smooth top cover and a ribbed 60mm diameter lower cover. Like the Classic shocks, the Magnum air valves are accessed by unscrewing and dropping down the top cover. The Black Alloy range were originally launched with Harleys in mind, but they have proved very popular with owners of many other makes and Fournales have greatly expanded the list of applications. Similar in size to Magnums, but finished in black with anodised aluminium hoops. 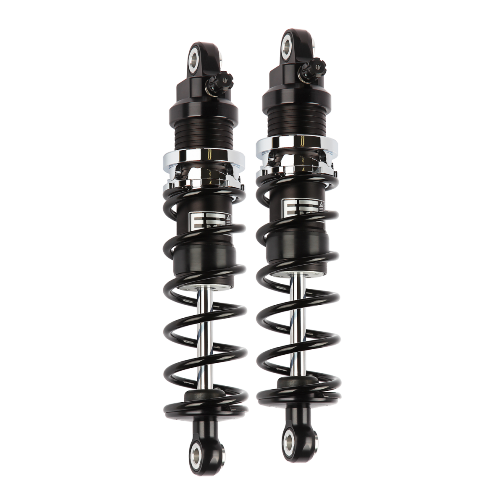 All Fournales shocks are light in comparison with traditional coil-sprung units, but these Black Alloys are super light! Fournales shocks are very long-lived and fully rebuildable if/when they eventually need refurbishing. They are supplied fully pressurised and ready to fit. Many riders find that the standard pressure suits them and do not need to change it. But if, for example, you plan a long distance 2-up holiday it makes sense to increase the pressure to convert the shocks into heavy duty units for the trip. A small hand pump (the HP30) provides up to 30 bar (430psi)and costs £52.50 or £45 if purchased with shocks. 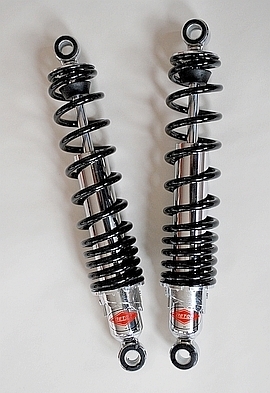 All Fournales twinshocks can be uprated for fitting to motorcycles with sidecars. This should be specified at time of order. The shocks will be built to match the additional weight, and in addition will run at an air pressure approx 30% higher than for the corresponding solo machine. 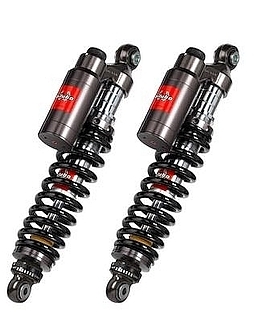 Although not cheap to buy, they can end up being much cheaper than inferior shocks because of the great mileages they can cover without significant loss of performance. As these shocks are all made to order in France, delivery takes approx 3 weeks, except in the summertime when, being French, the factory closes for the whole of august! Fournales Air Twins - slimline shocks with chrome sliders, black top covers and exposed schrader valves. The Wilbers twinshock range is quite varied, but for roadgoing twinshock sports bikes it mainly comprises the four models shown here, all of which are 36mm high pressure gas units. The 5xx series is the Ecoline range, with adjustable preload. The 530 series are the most purchased range, but these are also available as 531's with chrome top caps for an extra £16/pr, and as 540's - which have meatier bodies with 46mm diameter pistons - at £654/pr. Next comes the 630 series, which adds 22 clicks of rebound damping adjustment to the 530 spec. 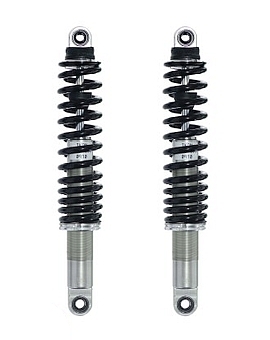 Then there’s the 632 series which are piggyback shocks and add compression damping adjustability. Plus for track day use we’d recommend the 633 series, which allow separate high-speed and low-speed compression damping adjustment. 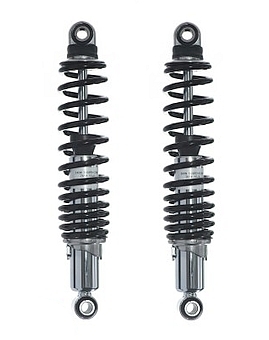 Heavy duty 640 Series shocks, which are chunkier with 46mm diameter pistons, are available for some bike models. 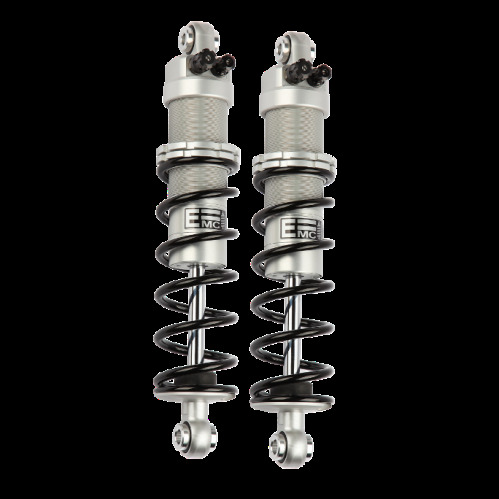 All shocks have true variable rated springs rather than simple progressives, which helps to optimise performance under variable road conditions. And uniquely (except the Ecoline range) you can specify the spring colour. Standard options are Blue Line, which have blue springs and red/blue coloured adjusters or Black Line which have black springs and silver adjusters. Or you can opt for the more expensive all black Nightline shocks - please phone for a price. And for an extra £65 you can select almost any spring colour, and there’s a handy page on Wilber’s website which shows how the many available colour options will look. See it at http://www.wilbers.de/ral.php. Wilbers build their shocks to order in Germany, to suit rider weight and riding style, and all are of course fully rebuildable. Expect around 3 weeks from the day the of order to delivery. 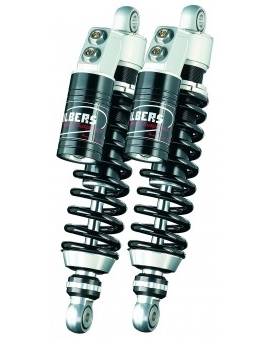 Wilbers 530 Series - Quality shocks with 36mm diameter pistons and self-aligning bearings. Wilbers 630 Series - adds 22 clicks of rebound damping adjustment. Springs can be black or blue. Wilbers 632 Series piggybacks have separate 22-click rebound & compression damping adjusters. 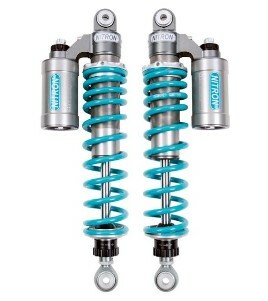 Totally new shocks from K-Tech! Most riders know K-Tech for their brilliant race-winning DDS monoshocks and innovative front-end kit. But this UK company, with more than 25 years experience in bike suspension, have now launched an all-new Razor twinshock range. Initial applications cover Triumph Bonneville, Scrambler & Thruxton, Kawasaki ZRX1100/1200, and Harley Dynas & Sportsters, but K-Tech have plans to widen the range considerably during 2016. 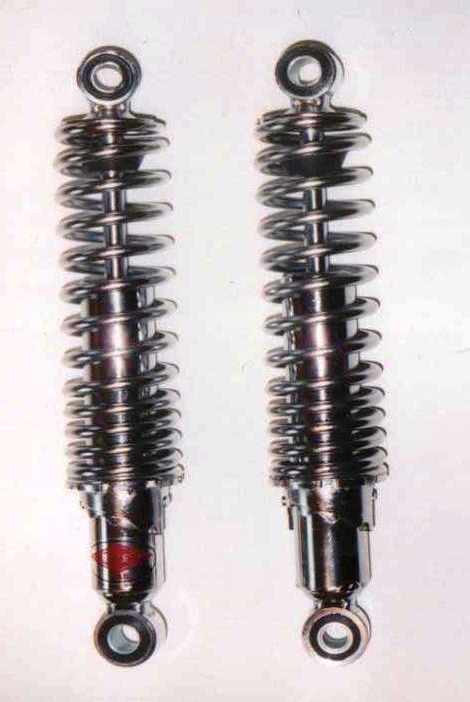 Razor IV’s are the piggyback shocks pictured. They feature separate rebound and compression damping adjustment, plus adjustable length and of course preload. Designed and manufactured in the UK to K-Tech’s very demanding standards, and built to order to suit your weight and riding style, the difference between these shocks and standard units is outstanding. And the external reservoirs will help keep the shocks cool when you’re pushing on. Expensive but quality costs! Also available as Razor III (also known as Razor Lites). These are the classically styled version without the piggyback reservoirs, and so also without compression damping adjustability. But also without quite a lot of ££££s. adjustment, adjustable preload & length. reservoirs allow adjustable compression damping. Red springs are a no-cost option. 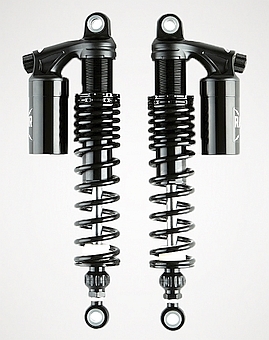 More totally new shocks from K-Tech! Not content with launching the Razor range of high performance coilover shocks, K-Tech have also designed, patented and delivered an innovative new range of strut shocks. These high pressure nitrogen shocks, aimed initially at Harley and Indian Scout riders, will also offer great performance and comfort to many bikes as the range develops. These BULLIT shocks have sealed nitrogen-charged dampers, with the pressurised nitrogen itself acting as a very progressive spring. So, like other air shocks the ride is controlled but comfortable, ideal if you have a sensitive back! Built to order in the UK to match rider weight. They are available in three styles. 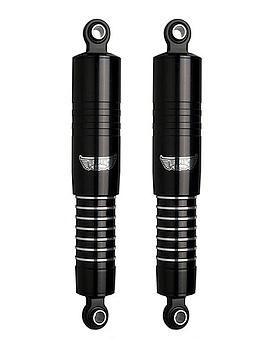 All have the same black dampers, but with a choice of black, chrome or gold piston sliders. News Jan 2016: K-Tech have developed a single BULLIT shock for the 2015-on Ducati Scrambler, price from £379 for the chrome slider version, available now! 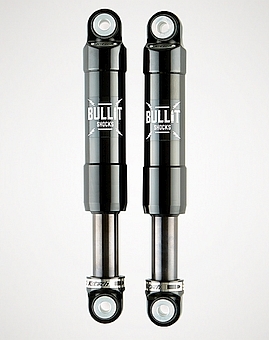 K-Tech Bullit high pressure air shocks. With black sliders as shown £618/pr. 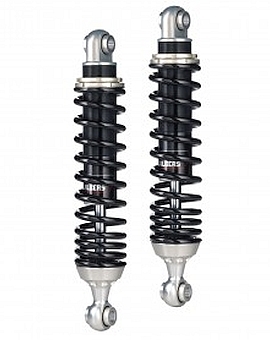 EMC twinshocks are the perfect combination of performance and design. They have low pressure gas tri-tube dampers mainly designed for comfort by optimising high speed (wheel) movement. They have a wide range of 26 clicks of damping adjustment, and since the ratio between compression and rebound damping is already fixed for each individual bike model following detailed testing, it is straightforward to find the damping set-up that suits you and your riding style. 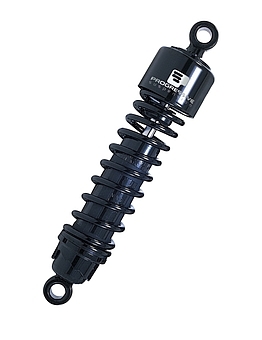 Plus, unlike an emulsion damper, EMC shocks consistently maintain their roadholding even over poor terrain, or when the shocks get hot when ridden hard. 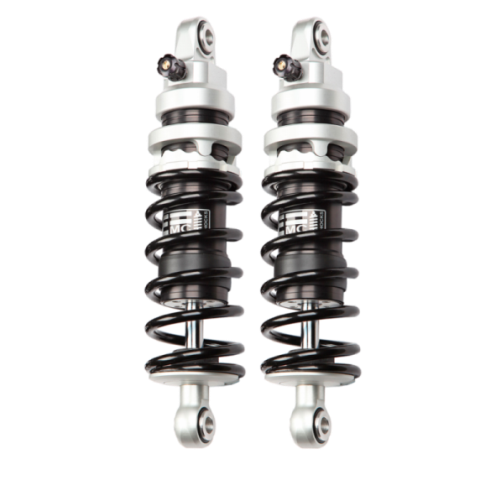 These shocks are also built to last, with lightweight alloy damper bodies, and SKF sealed bearing mountings rather than simple bushes. They are available in four main styles, all with the same internals, and two enhanced performance models. The best-selling Roadster shocks have steel bodies, while the Twin Alu are all alloy; the Custom Black style have hard anodised black bodies, and the Black & Chrome shocks are all black with chrome highlights. In addition there are the Twin Alu 2 and Custom Black 2 models, both of which have two damping controls to allow separate adjustment of high speed movement ( comfort) and low speed movement ( traction and stability). Built to order to suit your weight and riding habits, they are made from strong, lightweight 7075 aluminum, black anodised. EMC concentrate more on monoshocks, and their range of twinshock applications is limited. Made in France, delivery is normally 3 weeks. Nitron are not only one of the world’s leading designers and manufacturers of race suspension (for both bikes and cars) - they are also British! Their products are all developed for racing use, and even their road bike shocks use all the same technology and parts as the full race spec units. The use of high grade aluminium and titanium results in lightweight but strong shocks that are also well protected against corrosion. The R1 Sport twinshocks have a single 24-click adjuster which affects both rebound and compression damping simultaneously, making set-up very straightforward for general road use. Continuous preload adjustment and also adjustable length (for most models) are incorporated. The single tube nitrogen-charged dampers have 35mm pistons carried on 12mm rods, giving superbly stable control. 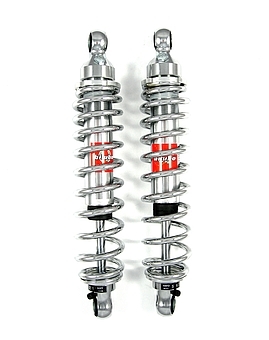 The R3 Race shocks are full-spec piggyback units. The dampers are again 35mm single tube units, with ultra low friction internals to further improve responsiveness, and 3 levels of damping adjustment to ensure the bike’s handling can be set up to match track conditions: 24-click rebound, 16-click high-speed compression and 18-click low-speed compression. Both models can also be ordered in classic or all-black styles to suit your bike. 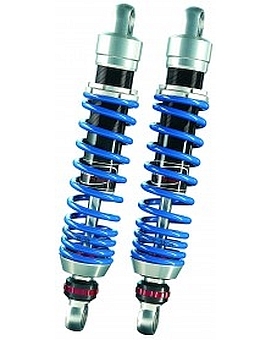 All Nitron shocks are custom built, valved and sprung to suit your weight and riding requirements. One unique feature is optional 20mm longer end eyes are available if required. Delivery is normally around 10 days.